Rio, starring Jesse Eisenberg and Anne Hathaway as the voices of two blue macaws, is stunning on Blu-Ray, and has tons of super fun extras. One of my friends who hadn’t seen Rio once referred to it as “Happy Feet, only with birds.” Admittedly, on the surface, it does seem a lot like that. There’s lots of dancing, plenty of animals, and an entire trough of well-known actors portraying the voices, making it seem like a gimmicky children’s film. But, the very fact that audiences underestimate Rio is why it is so good. I went in expecting a movie with three things: good musical numbers, solid animation, and funny voice performances. What I didn’t expect is that Rio has perfected all three of these categories, and it has a heavy dose of heart and love. At its core, director Carlos Saldanha‘s Rio is a story about love, taking chances, and what it’s like to be different. Blu (Jesse Eisenberg) is a rare blue macaw. In fact, he’s the only male of his species left, and he and his beloved owner, Linda (Leslie Mann), must travel to Rio. The reason for their trip is so that Blu may meet Jewel (Anne Hathaway), the last remaining female blue macaw. Shortly after they arrive in the beautiful Brazilian paradise, Blu and Jewel are kidnapped, and barely manage to escape. Unfortunately for Jewel, the two are still chained together at the foot. There’s a problem though, Blu is a domesticated nerdy bird who never learnt how to fly, which makes their maneuvering through the tropical forest anything but easy. On their quest to rid themselves of the chain, they run into a number of colorful characters like Rafael (George Lopez), a romantic toucan, Pedro (will.i.am) and Nico (Jamie Foxx), two hip-hop party animals, Luiz (Tracy Morgan), a bulldog with a drooling problem, and the dastardly Nigel (Jemaine Clement), a sinister cockatoo who doesn’t want the endangered macaws to be free. The inevitable pairing of Blu and Jewel plays out perfectly, emphasizing the idea that opposites attract, or “you complete me,” or, dare I say it, “two birds of a feather.” While the two seem to be polar opposites, whether it be from their background, lifestyle, or methods to survive, they build off of each other adorably. Their romance also reflects that of Linda and Tulio, another flawless couple. Who could be a better match for a bird-loving bookkeeper than a dorky ornithologist (bird scientist)? Supporting characters add the extra life and zing to Rio. 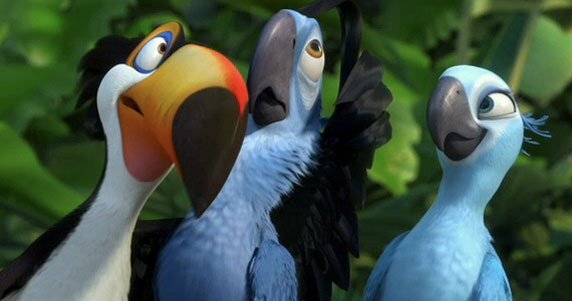 Although rapping animals seem to be all the rage in kids’ movies these days, Pedro and Nico are hysterical and exceptionally cute. When Pedro does his little rap/hip-hop dance to show Blu how he should seduce Jewel, I genuinely giggled. Morgan is also funny as the bulldog Luiz, who is basically Tracy Morgan in dog form, which is not such a bad thing. Even Lopez is enjoyable as Rafael, who is a family man despite his love of samba music and partying. He is the kind of character that you want to trust, but you’re afraid to do so. When Rafael tells Blu and Jewel that his mysterious friend Luiz can help them escape their chains, you know that shenanigans of the highest degree are going to occur. Rio‘s story is what constantly keeps your attention, but the tropical, beautiful background and masterful music is what keeps it entertaining. Whether it be the top 40-worthy mixes put together by will.i.am and Jamie Foxx or the scary, obligatory “this is why I’m a villain and this is what I’m gonna do” song, performed hilariously by Clement, the omni-present music is always adding to the film. Lastly, I was particularly happy with the film’s ability to delve into a moderately dark issue – smugglers capturing, and sometimes accidentally injuring or killing, exotic birds to sell on the black market – without being too scary for children or too preachy for adults. The scenes involving the topic are just bleak enough to alarm the viewer without being a turn-off. Rio is an exceptional children’s film that has the perfect balance of silliness and lightheartedness with real emotion and relatability. It’s a treat for the eyes, ears, and heart that will delight all audiences. The impressive Blu-Ray transfer really makes the difference with a film like Rio, which relies heavily on its animation as it is one of the film’s best features. Not since Finding Nemo have tropical scenes felt so alluring and striking. The careful detailing that went into each feather of each bird is evident on Blu-Ray, where each element down to Luiz’s drool is that much easier to appreciate. Sound, another terrific aspect of Rio, is highlighted on Blu-Ray, where it feels like you’re listening to will.i.am or Taio Cruz with some pretty expensive headphones. The atmosphere provided by the music is of constant delight and paradise. Listening to Rio is like what I imagine it would sound like walking into a real-life Sandals resort advertisement. Deleted Scenes: There’s only one deleted scene, exploring Blu and Jewel’s relationship through the introduction of foreign fruits, but it’s a pretty cute scene that’s worth watching. Explore the World of Rio: It might not be too interesting for the kiddies, but this is the point in the special features where those about to go on a vacation to Rio can really learn a lot. Saving the Species: One Voice at a Time: This is my favorite bonus on the disc, where we get to see the voice actors in their recording booths, and many of the leads are interviewed. If you’re expecting Jemaine Clement to be funny, you won’t be disappointed. The Making of Hot Wings: The film’s main animators are interviewed in this feature, where you get to see how they animate some of the characters like Blu, Nigel, and Pedro. Very informative and intriguing. Boom-Boom Tish-Tish: The Sounds of Rio: In this extra, music, Brazilian culture, and their usages in the film are discussed thoroughly by the experts. By the end of this feature, I was looking for the film’s soundtrack. Welcome to Rio Music Video: Just a repeat of the end of the film, where most of the main characters are seen performing the movie’s “theme song” of sorts. Cute, but unnecessary. Taio Cruz – Telling the World Music Video: Anyone who likes to see animated kids’ characters thrown into a Taio Cruz music video, which should be everybody, will enjoy this feature. Also, the song itself is pretty good. Postcards from Rio: Here’s another one for the kids (or the young at heart) where you get to make postcards inspired by the film, pretending that you’re on your own vacation in Rio. Again, this is super cute but obviously unnecessary. The Real Rio: The crew and cast both discuss the wondrous location of Rio in this feature, and again, Clement provides laughs. 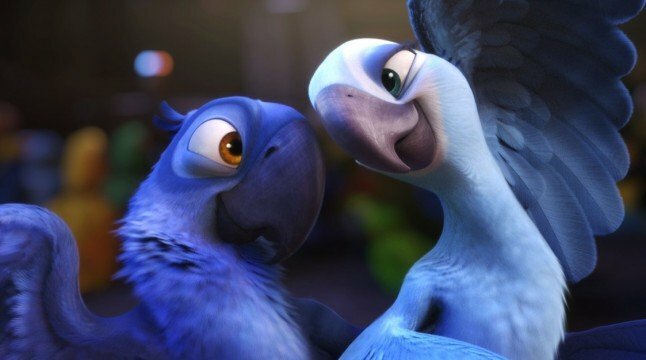 Rio is a fantastic film and a terrific treat for lovers of animation, kids film, and exotic music. The Blu-Ray elevates Rio to a whole new level, putting the entire experience up there with some of the best Pixar films in recent years. Special features on this Blu-Ray disc are enjoyable, cute, funny, and unique all at the same time. Go check out the Blu-ray for Rio, you won’t be let down.